The argid sawfly Sericoceros krugii wasn’t the only insect I saw associated with seagrape (Coccoloba uvifera) during my May trip to Puerto Rico. 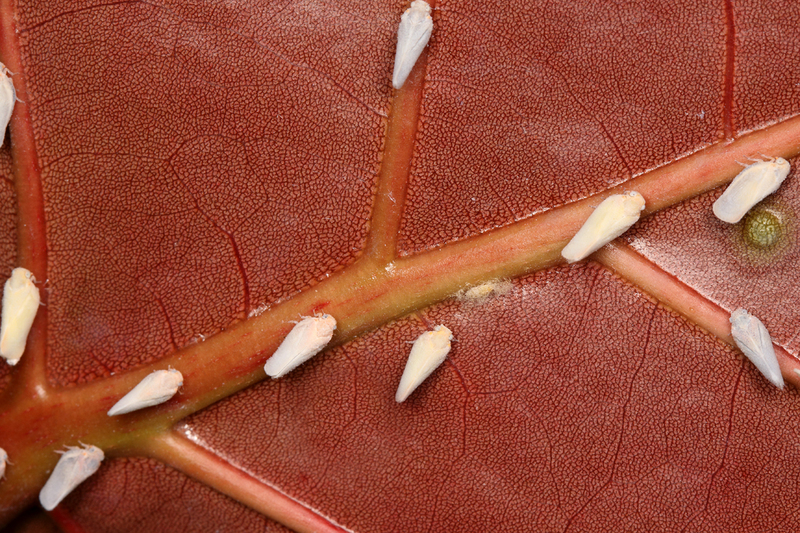 While exploring the magnificent coastal sand dune system near Isabela (northwestern Puerto Rico), I encountered a tree with literally dozens of frosty, white “homopterans” on the reddish lower surface of its newly expanded leaves (the photo below shows them at only about half the density that I saw initially, as many became disturbed and left when I tried to photograph them). Clearly they were planthoppers in the superfamily Fulgoroidea, with their general shape wings held tent-like suggesting either the family Acanaloniidae or its close relatives in the family Flatidae. A better look at the adults in the photos revealed the presence of numerous parallel cross-veins along the costal margin of the forewings, placing them squarely within the family Flatidae (species of Acanaloniidae have reticulate forewing venation without the parallel cross-veins). Wolcott (1948) lists a dozen or so species of flatids from Puerto Rico, roughly half of which belong to the subfamily Flatinae (wings held tent-like) and the other half belonging to the Flatoidinae (more flattened insects with wings held almost horizontal). The likeliest candidate seemed to be Ormenis marginata, which Wolcott describes as occurring in the “millions, vast clouds of them flying up from seagrape plants that one may disturb around Isabela…” I can’t say I saw “millions” of them, but certainly they were abundant on this one plant. My identification was kindly confirmed by Neotropical fulgoroid Lois O’Brien, who also noted that this species now goes under the name Petrusa epilepsis Kirkaldy. This seems to be a species that could cause considerable problems should it ever find it’s way to the mainland U.S. 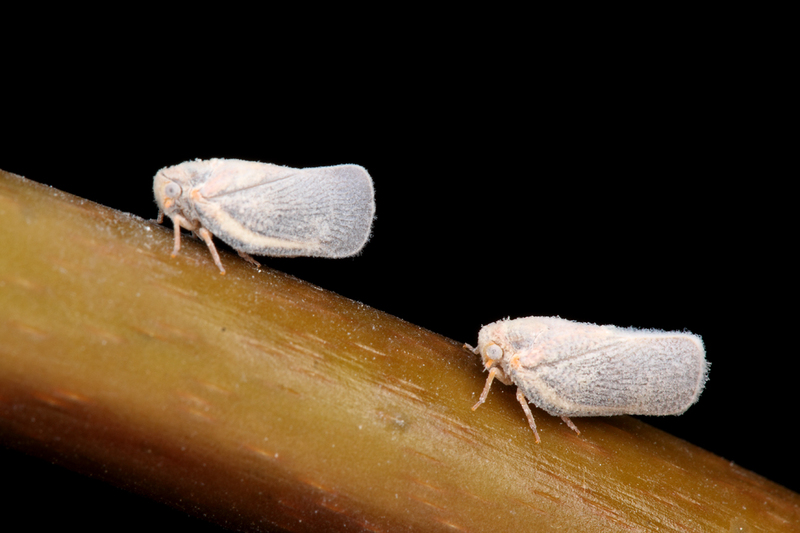 Many flatids are famously infidel when it comes to host plants—Metcalfa pruinosa (citrus flatid planthopper) being perhaps the best known example. Petrusa epilepsis not only feeds on seagrape but has also become a pest of coffee (Coffea arabica), coco-plum (Chrysobalanus icaco), jasmin (Jasminum spp. ) and black mangrove (Avicennia germinans), with damage resulting not only from direct feeding but also the development of sooty mold that colonize the honeydew excreted by the bugs that covers the foliage of the plants they infest (Nieves-Rivera et al. 2002). A particularly amusing passage by Wolcott was his observation that adults “with care may be chased around a stem by gentle pursuit with a lead pencil.” I can add that a finger works equally well, as I used precisely this technique to get the adults in these last two photos positioned precisely where I wanted them for the photographs. Let’s hope they are as easily kept within their current West Indies distribution and are not eventually unleashed as yet another exotic pest for agricultural producers in tropical and subtropical mainland America to deal with. Nieves-Rivera, Á. M., T. A. Tattar & E. H. Williams, Jr. 2002. Sooty mould-planthopper association on leaves of the black mangrove, Avicennia germinans (L.) Stearn in southwestern Puerto Rico. Journal 26:141–155. Wolcott, G. N. 1948. Insects of Puerto Rico. The Journal of Agriculture of the University of Puerto Rico 32(1):1–223. 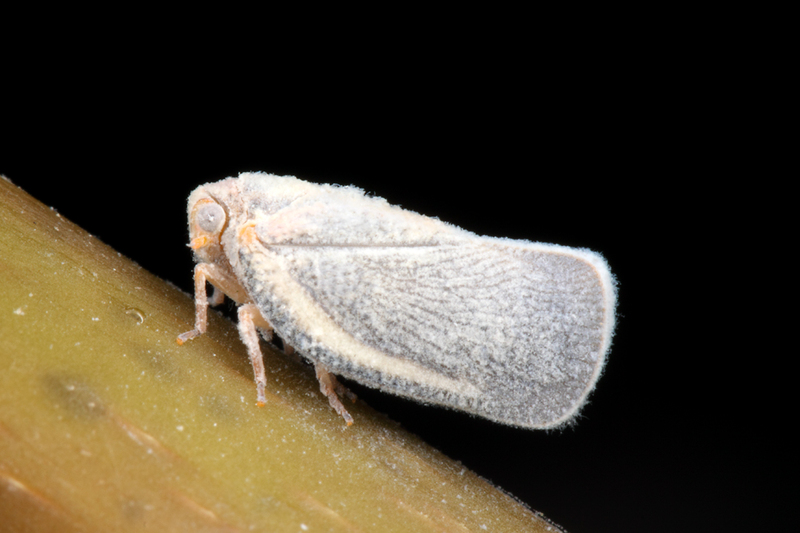 This entry was posted in Flatidae, Hemiptera and tagged entomology, insects, nature, planthoppers, Puerto Rico, science, true bugs. Bookmark the permalink. They seem to be covered with white dust, scales, or mold or is it dust on my computer screen? That’s a waxy covering produced by the insect. Many planthoppers produce such wax – I presume it has some defensive function, as nymphs are often heavily covered by it. Ted, these look so soft… I am sure you have been asked this question before. Sorry to be repetitive. What kind of camera do you use to get these kinds of close-ups? How cheap a camera can one buy for a reasonable close=up? Hi Sharman – these were taken with a Canon 50D, but the secret is the lens and lighting rather than the camera itself – in this case a 100mm macro (with extension tubes for the super close-up) and twin macro flash. See BitB Goes dSLR for detailed description of my camera setup. I’m not up on current camera offerings, but quality of macro settings on relatively inexpensive cameras continues to increase. People like Crystal Ernst are taking fantastic macro photos with relatively inexpensive gear.